Bank risk-weighted assets differ significantly across banks. Using a unique database covering Europe’s top 50 banking groups, this column argues that national segmentations explain a significant (albeit decreasing) share of this variability. Furthermore, institutions that rely more heavily on the internal ratings-based approach have reduced more (or increased less) their corporate loan portfolio. This effect is somewhat stronger for banks located in Eurozone periphery countries during the 2010-12 sovereign crisis. Since 2004, banks have developed internal models that generate lower risk-weighted assets (RWAs) in order to achieve capital savings. This has prompted distrust towards internal ratings (e.g. Le Leslè and Avramova 2012, EBA 2013), and investors have started to look at ‘RWA tweaking’ as a suspicious practice. After the Global Crisis, as supervisors and investors were keen to see banks reinforce their capital but lenders found it costly to tap the equity market, internal ratings-based (IRB) models may have provided a way to make ends meet. 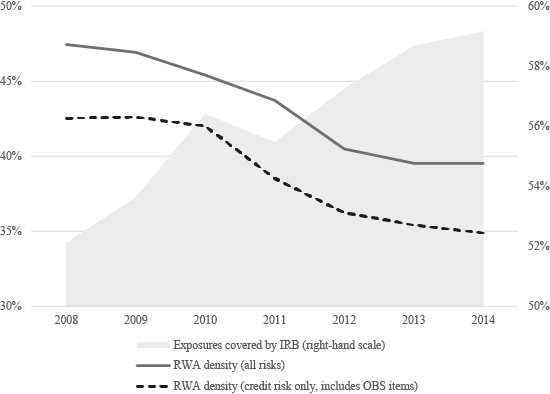 Figure 1 shows the average RWA density (RWAs over unweighted total assets) for Europe’s top 50 banking groups: between 2008 and 2014 – with credit risk increasing in most countries – RWA density fell significantly; the increasing use of the IRB approach (also shown in the figure) may have played a role in the process. In fact, as IRB adoption only occurs upon request, banks are likely to leave the standardised approach only if they anticipate substantial benefits. Notes: 50 largest banking groups in the EU by total assets. Simple averages. In March 2016, the Basel Committee released proposal aimed at reducing undue variability in RWAs (BCBS 2016a). According to this proposal, IRB would be abolished for exposures (such as loans to financial institutions) where defaults are too infrequent to allow for a reliable calibration. Additionally, internal models would be disciplined through a set of constraints on the risk parameters (‘input floors’). Finally, an ‘output floor’ would be imposed, whereby the capital requirements generated by IRB would not be allowed to fall below some percentage (e.g. 75%) of those dictated by the standardised approach. Such proposals are still under discussion, and consensus building is proving harder than expected, also due reservations raised by the Trump administration (Hamilton 2017). The Committee may also reform the rules that currently assign zero risk weights to a bank’s domestic public sector. Such a change might be beneficial for corporate lending, by curbing incentives for overinvestment in government debt. However, there is a risk that the new rules may prove disruptive for heavily indebted countries. What drives differences in RWAs? So, what drives a bank’s RWA density? In a recent study based on Europe’s top 50 banking groups, we use Pillar 3 data (cleaning and reconciling information published in supervisory reports) and find that risk weights are affected by bank size, business models and asset mix (Bruno et al. 2017). Specifically, higher risk weights are associated with smaller banks engaging in the traditional deposits and loans business, and exhibiting a larger share of corporate loans. Unsurprisingly, we also find that the adoption of internal ratings-based approaches is an important driver of bank risk-weighted assets. Lower risk weights are also associated with larger capital cushions, consistent with the hypothesis that banks reaping greater benefits from risk-weight optimisation must keep a higher buffer over the regulatory minima. National segmentations also explain a significant (albeit decreasing) share of the variability in risk weights. There are signs that IRB usage is more widespread in countries where banks are in a better position to lobby local supervisors into approving internal models (i.e. market concentration is stronger and the ratio of bank total assets to GDP is higher). How can we discipline RWAs? The fact that a significant share of risk-weight heterogeneity (and IRB usage) is still explained by national segmentations calls for an increase in supervisory efforts to ensure greater homogeneity in validation and calibration procedures. The EU has already engaged in such efforts, and a number of promising developments are taking place. Guidelines and technical standards are being released by the European Banking Authority (EBA) to clarify how key Basel requirements should be interpreted and implemented (EBA 2015). Likewise, the Single Supervisory Mechanism has recently launched a wide-ranging exercise (the Targeted Review of Internal Models, or TRIM) aimed at harmonising IRB usage across Eurozone banks. Additionally, the EBA and other competent authorities have engaged in ‘benchmarking exercises’, requesting IRB banks to use their models on a common benchmark portfolio1 to uncover sources of undesirable variability and challenge unrealistic assumptions. Such efforts should be promoted on a global scale, including in non-EU jurisdictions. Peer review processes led by supranational bodies could be deployed to highlight differences across countries, with a view to promoting consistency and putting pressure onto weak supervisory practices. Did internal models constrain corporate lending in 2008-2014? Our study also looks at how the use of internal models for regulatory purposes may have affected banks’ attitudes towards lending to corporates and sovereigns in 2008-2014. We find that banks using IRB approaches more extensively have reduced their corporate loan portfolio more (or increased it less), both in absolute terms and as a share of total credit exposures. This effect is (slightly) stronger during the 2010-2012 sovereign crisis for banks located in GIIPS countries. However, it apparently did not lead to a reallocation from corporate loans to government exposures, possibly because the latter are mostly associated with zero risk weights under the standardised approach (hence, internal ratings cannot provide any further incentive to allocate more credit to the public sector). In fact, other motives seem to prevail in explaining banks’ shift towards government bonds during the Eurozone crisis, including the so-called ‘financial repression’ (or moral suasion) channel (Altavilla et al. 2016). The negative impact of internal ratings on corporate lending provides further evidence on the pro-cyclicality of risk-based capital requirements and internal ratings (BCBS 2011, Behn et al. 2016). By making banks more risk sensitive, IRB induces lenders to cut loans in bad times, and more so if they are headquartered in financially stressed countries. IRB pro-cyclicality: More to be done? Further attention should be paid to ensuring that internal ratings do not generate excessive swings in capital requirements across the economic cycle. Indeed, the ‘Basel III’ approach (BCBS 2010). (where capital requirements adjust to the cycle through ‘capital conservation’ and ‘countercyclical’ buffers) is only a partial solution, and more work on reducing rating volatility is still called for. Regulators should keep in mind that IRB procyclicality hinges on two distinct profiles: rating assignment and rating quantification. Constraints on them should be imposed consistently to avoid generating undesirable results. For example, when a bank assigns ratings based on a short-term perspective, a recession can be expected to trigger a considerable shift in the loan portfolio towards lower grades. Hence, if supervisors also require banks to quantify PDs by focusing on the latest default rates, this will duplicate the effect of the recession, leading RWAs to overshoot. The negative impact of internal ratings on loan supply in 2008-2014 shows that they have proved effective in capturing the increase in credit risk. Accordingly, while IRB should be calibrated to avoid RWA manipulation and excessive swings in capital requirements over the cycle, it is not to be dismantled or disempowered by hastily imposing exogenous risk floors. Indeed, internal rating systems involve huge costs in terms of data, econometric tools, specialised personnel, reliable documentation, validation procedures, and interaction with supervisors. European banks have been investing heavily in such systems, relying on a regulatory framework that allowed for capital relief in case of low-risk, high-quality exposures. By imposing floors across the board, supervisors would give banks an additional ‘risk budget’, which they would use to absorb the extra costs generated by higher regulatory capital. Hence, portfolios where the actual risk content is below the floor would gradually shift towards more lucrative (and riskier) exposures. Internal ratings have become a common language, whereby different structures within a bank can communicate horizontally (ensuring consistency between commercial targets and risk-appetite constraints) and escalate risks to the board of directors. This framework could be severely disrupted if risk assessments were biased by conservative floors, lacking credibility in the eyes of the top management. In short, the temptation to go down the avenue of ‘simple’ regulatory fixes, such as IRB floors, should be resisted (Resti 2016). Instead, efforts to improve supervisory consistency should continue, and become the focus of the EU’s policies on internal ratings. Altavilla, C, M Pagano and S Simonelli (2016), “Banks exposures and sovereign stress transmission”, Working Paper No 11, European Systemic Risk Board. Basel Committee on Banking Supervision (BCBS) (2010), “Basel III: International framework for liquidity risk measurement, standards and monitoring”, Bank for International Settlements, Basel. BCBS (2011), “The transmission channels between the financial and real sectors: a critical survey of the literature”, Working Paper No. 18, Bank for International Settlements, Basel. BCBS (2016a), “Reducing variation in credit risk-weighted assets – constraints on the use of internal model approaches”, Consultative document, Bank for International Settlements, Basel. BCBS (2016b), “Regulatory consistency assessment programme (RCAP) – Analysis of risk-weighted assets for credit risk in the banking book”, Bank for International Settlements, Basel. Behn, M, R Haselmann and P Wachtel (2016). “Pro-cyclical capital regulation and lending”, Journal of Finance 71(2): 919-956. Bruno, B, G Nocera and A Resti. (2017), “Are risk-based capital requirements detrimental to corporate lending? Evidence from Europe”, CEPR Discussion Paper No. 12007. European Banking Authority (EBA) (2013), “Interim results update of the EBA review of the consistency of risk-weighted assets”, London, 5 August. EBA (2015), “The Future of the IRB Approach”, Discussion Paper No. EBA/DP/2015/01, London. Hamilton, J. (2017), “Yellen urged to halt talks on global bank rules for Trump review”, Bloomberg, 31 January. Le Leslè, V and S Avramova (2012), “Revisiting risk-weighted assets. Why do RWAs differ across countries and what can be done about it?”, IMF Working Paper No 12/90. Resti, A (2016), “Banks’ Internal Rating Models - Time for a Change?”, European Parliament In-depth Analyses, PE 587-366. Benchmarking exercises have also been carried out by the Basel Committee on Banking Supervision; see BCBS (2016b).